Raspberry Chocolate Cake layered with dark chocolate mousse. 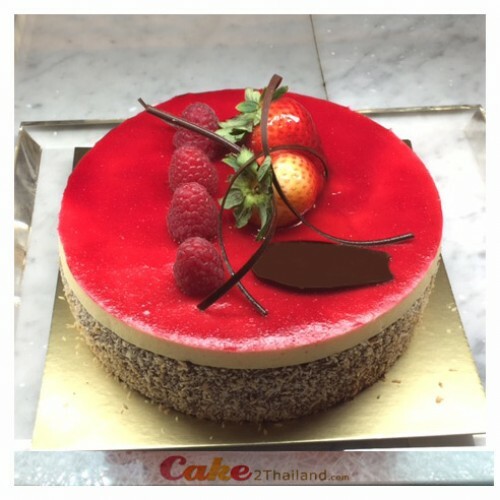 Raspberry Chocolate Cake - G14 is a special recipe from Cake 2 Thailand ®. Chocolate cake layered with dark chocolate mousse and refreshing raspberry mousse and glazed with sweet bright red raspberry confiture. It nice cake for tea break. Presented in a beautiful gift box. Sure to be impressed. Free delivery in Bangkok and surrounding area. Same day delivery now available. Place your order by 6pm. (US Time Zone) or 12pm. (UK Time Zone). Your cake will be delivered the same day or within 3-5 hours. Please note however if your preferred cake is not available we may substitute another cake. - Raspberry Chocolate Cake is Only delivery in Bangkok.